Mel Gibson hasn’t directed a film in over ten years, and I think we all know why. Yes, the road to forgiveness for the once-decorated movie star has been pretty rough, and aside from the odd lead performance in smaller films like Blood Father, How I Spent My Summer Vacation and The Beaver, he can barely convince anyone nowadays to greenlight a film he wants to make, let alone star in. In fact, aside from those films, the only other ones he’s appeared in over the last decade or so were Machete Kills and The Expendables 3 – that alone should speak volumes in how much Hollywood doesn’t seem to care about Mel Gibson anymore. So, it more or less makes sense that his first major directorial project since 2006’s Apocalypto, the wartime religious drama Hacksaw Ridge, be the kind of awards contender that would show up in Academy members’ wet dreams, enough to hopefully get Gibson back in their good books after years of disdain. But is it a good one? Well, it’s certainly got its strong factors, but also a few overly corny ones that feel a little too much at times; but either way, it makes for an entertaining experience. The film tells the story of Desmond Doss (Andrew Garfield), a young man from 1940s Virginia whose strong faith in Christianity extends to him practising the commandment of doing no harm to his fellow man. Nonetheless, when war breaks out he decides to enlist as a medic, but runs into trouble when his strong beliefs cause him to refuse to even hold a weapon when in combat. Through several trials and tribulations – figuratively and literally – he’s permitted to join the front lines during the US Army’s assault on Hacksaw Ridge in Okinawa, Japan, which is where his name becomes most synonymous. Gibson is no stranger to war films as well as faith-based films, having starred in a bunch of the former and directed the highest-grossing religious film of all time, The Passion of the Christ, and here he gets to indulge in both of these themes in the only way that someone like Gibson could pull off. 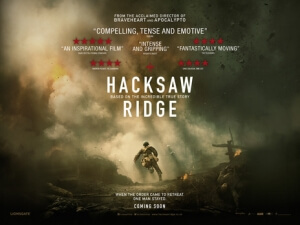 If you’ve seen any of his previous films as a director, you’ll most likely know of his tastes for the extreme, whether it be on-screen violence or heavy-handed sentimentality, but Hacksaw Ridge is an interesting case of being made up of two halves, both containing wildly different themes and tones, and more often than not feeling like two completely separate movies. The first half, which is dedicated to Doss’ upbringing and training at an army base, goes all Full Metal Jacket with the army clichés, right down to a shouting Sergeant that has amusing comebacks (here played by Vince Vaughn, doing as best an R. Lee Emery impression as he can) and an antagonising bully character who has it out for the lead, as well as leaning far heavily towards the sap factor, with Doss dealing with his alcoholic father (Hugo Weaving) and romancing a pretty local nurse (Teresa Palmer), feeling as calm and safe as an awards contender can be. However, the minute we finally arrive at Okinawa and the titular location, things are knocked up a notch and we are treated to the bloodiest, most intense scenes of war since the opening of Saving Private Ryan. Limbs are shot off, faces are blown up, rats and maggots are feasting on several corpses, blood is literally raining down from the sky, it is pure carnage and a half. Although at times it does feel like two radically different films have been mashed together to make a whole, both halves have a strong entertainment factor to them, as you’re with this guy all throughout and, thanks to Garfield’s heartfelt and sweet performance, you do want him to get out of all this in one piece, whether it’s surviving the harsh personalities during his training, and the even harsher scenes on the battlefield. The second half is by far and away the stronger of the two, as the scenes where countless American and Japanese soldiers shooting at each other and ripping their guts out are breathtakingly shot and choreographed, and I hope to God that the stunt team for this film was rewarded handsomely, because when you see some of the things these guys do on-screen whether it be hurtling through the air from explosions or having every single limb blown off their bodies, you’re just astounded that a director like Gibson can still depict something this gruesome and intense. The sound work on this film is outstanding too, and if there was at least one Oscar this film deserved it’s for how these sound designers effortlessly make you feel every bullet, every explosion, and just about everything you see used to kill as many soldiers as possible. It’s worth paying the ticket price to see this carnage unfold, but it does mean sitting through a first half which, though not bad, can be a bit too sentimental and syrupy for some people to stomach. Hacksaw Ridge is a film made up of two wildly different halves, with the first being a decent but syrupy faith-based war drama, and the second being an impressively gruesome display of war and carnage, all of it being held together by stern and intense direction by Mel Gibson, and a heartfelt and sweet lead performance by Andrew Garfield.